The Angolan Civil War, beginning at the time of the country’s independence from Portugal in 1975, was a 27-year struggle involving the deaths of over 500,000 soldiers and civilians. Initiated at the height of the Cold War, pro- and anti-communist forces in Angola set the stage for a proxy fight between the United States and the Union of Soviet Socialist Republics (USSR). Though the fighting officially ended in 2002, Angola remains in economic and social turmoil with a massive refugee crisis and millions of landmines impeding farming practices. Rich in diamonds and oil, Angola was one of the last African nations to receive independence from a European power. On April 25, 1974, a Portuguese military coup d’état protesting the country’s colonial practices successfully overthrew the regime. The combined forces of the Popular Movement for the Liberation of Angola (MPLA), the National Front for the Liberation of Angola (FNLA), and the National Union for Total Independence of Angola (UNITA) created a transitional government with the Alvor Accord of 1974. Within a year the government had disintegrated, and with aid from the USSR and the Cuban military, the Marxist-oriented MPLA under the leadership of José dos Santos had wrested control of most of Angola. Indirectly and through proxies, governments from the United States, Brazil and South Africa funded UNITA, providing munitions, intelligence reports, and mercenaries. Heavy fighting continued until 1991 when a temporary agreement known as the Bicesse Accords was reached. 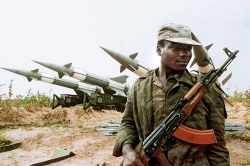 Calling for an immediate ceasefire and the removal of both Cuban and South African troops, the agreement mandated a new national government and army, along with Angola’s first multi-party elections. A year later, MPLA candidate José dos Santos won 49% of the popular vote in the election compared to 40% for UNITA candidate Dr. Jonas Savimbi. When Savimbi disputed the outcome, UNITA resumed guerilla war against the MPLA. In 1993 the United Nations Security Council passed Resolution 864 placing an embargo on petroleum and munitions shipments to UNITA. UNITA continued military operations until Savimbi was killed in an ambush in February of 2002. Officially demobilized that August under less-radical leadership, UNITA has since been a formidable political party in Angolan politics. Though a country rich in natural resources, Angola was economically and politically devastated with runaway inflation of the country’s currency (the kwanza), a national crisis of amputees from the millions of landmines, and political fallout from the millions of refugees displaced from the fighting. Kevin Shillington, Encyclopedia of African History (New York: Fitzroy Dearborn, 2005); Fernando Andresen Guimaraes, The Origins of the Angolan Civil War: Foreign Intervention and Domestic Political Conflict (London: Macmillan Press, 1997); John A. Marcum, The Angolan Revolution, Vol. 2: Exile Politics and Guerilla Warfare (1962-1976) (Cambridge: MIT Press, 1978).